WEST LAFAYETTE, Ind. 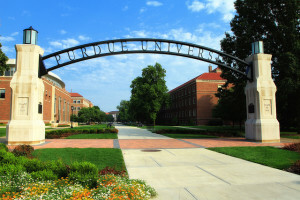 — Officials at Purdue University have reached a compromise with a donor who had sought legal counsel after the university refused to engrave an inscription on his dedication plaque that included a reference to God. As previously reported, Dr. Michael McCracken and his wife made a donation to the university in 2012, and was asked to provide an inscription for the plaque, which was to be posted at the recently renovated Herrick Laboratories. Last October, university officials informed McCracken that they would not be utilizing the submitted language as they wished to avoid the appearance of promoting religion. McCracken then contacted the Texas-based Liberty Institute, requesting assistance from the Christian legal organization. Local legal office Covington and Burling LLP also became involved. Late last month, attorney Robert Kelner sent a letter to Purdue on behalf of McCracken and the organizations representing the donor, noting that the university’s reasoning was flawed. The university argued back that the inscription could still be problematic. But according to an article published this week by the Purdue Exponent, an agreement has now been reached without litigation. The report states that university officials accepted revised language presented by McCracken—still retaining the reference to God, and will post a second plaque notating that the donor’s language is private and that the university is neutral on the matter. “Dr. Michael McCracken: ‘To all those who seek to better the world through the understanding of God’s physical laws and innovation of practical solutions.’ Dr. Michael and Mrs. Cindy McCracken present this plaque in honor of Dr. William ‘Ed’ and Glenda McCracken and all those similarly inspired to make the world a better place,” the plaque will now read. McCracken said that he was satisfied with the resolution, noting that he believed it was important to fight for his right to reference God.